Descr. Cact. Nov. iii. 5 (1963). Altitude: 1800-3000 metres above sea level. 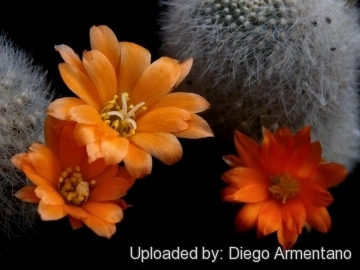 Description: Rebutia muscula is one of the many geographical forms of the extremely variable Rebutia fiebrigii. 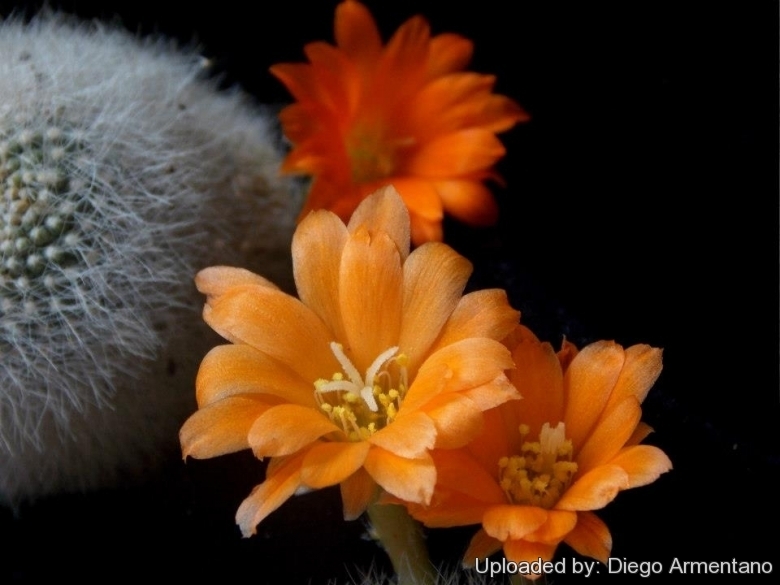 The Rebutia muscula forms form low cushion covered by dense furry white spines and produces vibrant orange-red flower. The dense spines would protect it from the extremes of cold and sunshine. Stem: Hemispherical, later elongated, somewhat depressed at apex, pale green, 3-4 cm wide, 4 cm tall. The stems of this cactus grow usually taller than they are broad. It would appear that in cultivation they grow larger and cluster more vigorously than in habitat. Ribs: 25-40, with almost square tubercles, about 2 mm high. Areoles: Short oval, 1-1,5 mm long, on the tops of tubecles, white tomentose, about 3 mm apart. 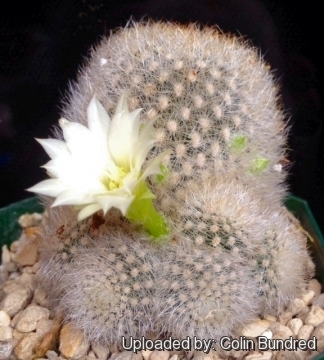 Spines: About 50 (in cultivation often less, to about 30), bright white, 2-4 mm long, spreading in all directions, fine and soft tightly enveloping the plant body. Central spines hardly distinguishable, somewhat shorter. Flower: Deep orange, funnel-shaped, up to 3,5 cm long, 2-3 cm in diameter from the base of the stems. Ovary green, with small scales, with with white woolly flakes and about 10 whitish hairy bristles in the axils; Floral tube funnel-shaped about 15 mm long, 3,5 mm wide at the base, above about 5 mm wide, outside light olive green, glossy, green-scaled, with hair and several soft white thin bristle. Tepals, pale reddish orange, about 20 mm long and 5 mm wide, inner ones darker and serrated at the tips, outers more pointed, all widely spread. Filaments whitish, 7-8 mm long, mounted in two series, on the the bottom and the edge of the tube. Anthers yellow. Pistil whitish, with 4-5 yellowish stigma lobes, about 4 mm long, protruding above the highest anthers. There is also a white flowering form. Blooming Season: Flowers profusely throughout spring into summer with spurts of flowering into autumn. Fruit: Tiny, berrylike, about 5 mm large, spherical, green-brown, with flowers remnants hidden among the spines, bursting when ripe. Seeds: Black, about 1,2 mm long, 0,8 x 0,7 mm wide, elongate oval, with a more curved dorsal side, testa with small, tubercles, hilum basal brownish. Remarks: Rebutia muscula is quite variable. The differences usually concern only the spination, along with the more common pure white forms, there are also plants with yellow spines. 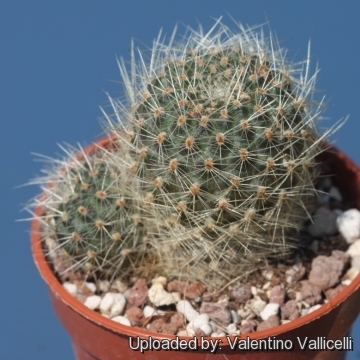 However the colouring of spines is greatly influenced by the conditions of culture, at lower light levels the spines are less numerous, delicate and white, while with strong solar radiation the spines are stronger with a yellowish tint. Minor differences can also be found in the colour of flowers sometime with a more yellow tint. 14) Lowry, M. 2013. Rebutia fiebrigii. The IUCN Red List of Threatened Species. Version 2014.3. <www.iucnredlist.org>. Downloaded on 28 April 2015. 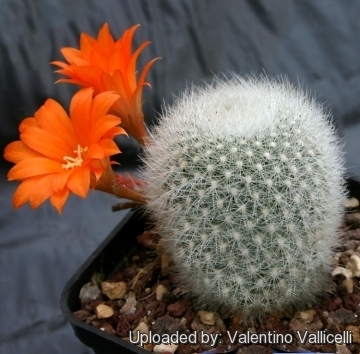 Cultivation and Propagation: Rebutia muscula is a summer grower species that is easy to cultivate and recommended for beginners. The whole Rebutia fiebrigii complex has delightful flowers and the plants remain compact, and clumps can easily be managed by division. Another advantage is that the plants are cold hardy in winter if kept dry.